“You folks are the best trainers I’ve got,” Coach Greg Glassman told the 90 or so HQ Seminar Staff trainers assembled at the Marriott in San Diego, Calif., on Oct. 26, 2011. Looking around the room, you’d be hard-pressed to disagree with him. Adrian Bozman, Pat Sherwood, Chuck Carswell, Todd Widman, E.C. Synkowski, Aimee Lyons, Jenn Hunter-Marshall—the roll call was a laundry list of the very best of the CrossFit community that extends beyond North American into Europe, Australia and beyond. You’d also be hard-pressed to find a better group of athletes outside of the CrossFit Games themselves. The Seminar Staff includes two Games champs in Annie Thorisdottir and Jason Khalipa, as well as perennial Games competitors Heather Bergeron, Chris Spealler, Lindsey Smith, Austin Malleolo, James Hobart, Matt Chan, Par Barber and more. 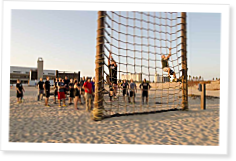 In the world of CrossFit, you won’t find a more talented and passionate group of individuals, and they were all gathered in San Diego for several days of team building, professional development and workouts. Thanks for the write up, Mike. I'm so grateful beyond words to be a part of the HQ Staff. One of the many things to give thanks for this holiday season.